When they first came to this country in 1971, my two uncles stayed as paying guests with a sweet Indian auntie in Leicester. On most days, when they arrived home in the evening and opened the kitchen door, they were consumed by the overpowering smell of brussels sprouts, and when it wasn't brussels sprouts curry, it would be broad beans curry. Brussels sprouts or beans curry with roti every evening doesn't exactly sound appetizing (they moved four months later.) They'd often fill up on chips and a two-course lunch at their college for 12 pence. It's no wonder we've never in all these years tried brussels sprouts or broad beans curry! To think of the varieties of vegetables we can now buy at the supermarket, the number of Indian shops stocking the most authentic spices and Indian vegetables that can't be found elsewhere... a mere four decades later. Well, I do like these small globular green bundles called brussels sprouts (once in a while) and having made brussels, kale, red cabbage and lentils salad for Christmas lunch, I decided to try my hand at a curry today. I mixed it with parsnips, sweet and rich in dietary fibre. Both vegetables retain a very slight crunch even after being cooked, and both absorb the aromatic masalas so that each time you bite into a sprout or a parsnip, it is richly infused with the blend of onions, garlic, ginger, tomatoes and all the heady masalas which work together in creating the perfect curry. Cut the brussels sprouts in half and the parsnips in round pieces. Bring a pot of water to boil and add both vegetables. Blanch in hot water for about 5 minutes, drain and leave to one side. Now heat the oil, mustard, fenugreek and cumin seeds in a large pan on low heat. When the mustard seeds start to pop and the cumin seeds are brown, add a pinch of asafetida and immediately add the chopped onions. Stir the onions in the oil and once cooked and brown, add the chopped or grated garlic as well as the ginger, garlic and chili paste. Stir this for a minute before adding all the masalas -- coriander, cumin and turmeric powder, and the salt. Now you can add the chopped tomatoes and tomato puree, forming a thick paste. 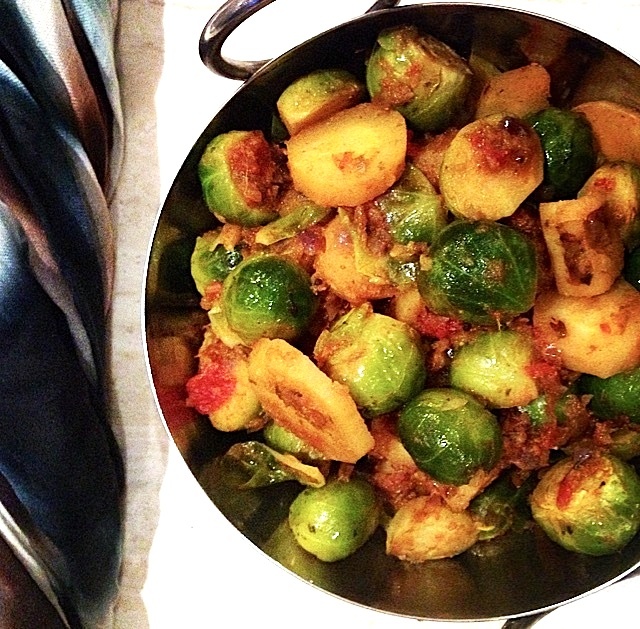 Pour in the brussels sprouts and parsnips and mix thoroughly. Add the water and let this cook on low to medium heat for another 10-15 minutes until the vegetables are soft.